Book a remote proctored on-line exam with us and we'll give you a years full access to the course's fully Instructor Supported contents FREE. Scroll down to see the full course outline. 9½hrs of live presentation of animated graphics split into bite-sized exam preparation video chunks (Risk free purchase: preview many free-access videos - scroll down). Each is bite-sized, together they are exhaustive. AXELOS publish PRINCE2-Agile guidance and a linked, globally valued Practitioner Exam. PLUS the qualification is a great career boost and a corporate advantage in bid responses. PRINCE2-Agile (p2a) guides in practical terms how to get the best of two heritages. Agile >>Delivery << using proven behaviours, concepts, techniques and frameworks in a lightweight blend with PRINCE2®'s>>Control<< capabilities. Prepare on-line, whenever suits you. Take the globally recognised exams with us; on-line whenever suits you. (PRINCE2® is a registered trademark of AXELOS Ltd, PRINCE2 Agile® is a registered trademark of AXELOS LTD). Is the exam preperation instructor supported? Yep :-), fully supported. eMail p2a@logicalmodel.net NOW if you want Simon's help. Use the disqus forum in the course too. Why might I want an exam course? The exam independently confirms you understand the material in a way that may positively sway clients and employer's decision making. Is the course worth it if I'm convinced "the exam is not for me"? I think so but maybe I'm biased. I've made lots of the course accessible as preview so you can gauge for your self. Its true that the course is focussed on the exam so that means it explains the manual's view of things. It also means where I can extend the manual's insights I give sign-posts that link to resources rather than cover it here and where I disagree with the manual then mostly I don't voice the disagreement, to avoid exam confusion. I hope it's the best of both worlds; clear exam guidance plus where to look for added-value when making Back@Work™ use. We aim to make the course valuable even if the exam isn't your goal, but we also know that an exam aspiration sharpens your focus and resolve. You get the spirit and concepts of agile and prince2 explained by an experienced PM and experienced PM trainer. The skills to use the manual's contents just does not come off the page of the official manual. The manual isn't a training aid but this course is! Our training is what you need for confident, real world, post-exam use of p2 & agile. You get 2 full practice exams from the authoring team that sets the live exams. I recommend saving one to near course end but that is your choice. We give you plenty of challenging, additional questions, quizzes and revision aids, puzzles, games, audio/ pod-casts etc etc to suit turning dead-time into study time. You get a self-help community of other people preparing and sharing their successes, questions and concerns - it helps to see others solving the exact same conundrums you face as you prepare and it feels good to share your answers and questions with them. You get Simon's support every step of the way. Do I need the AXELOS official manual for the exam? We have tried really hard to make the course comprehensive - that's obvious right? Why would anyone sell a course whose main message is you have to read some other book - Amazingly that is other training company's standard approach! Where can I get the Official Manual? Does the course cost include the exam fee and the official manual? When you subscribe to our course we become your sponsoring ATO. The exam can only be booked on your behalf by your 'Sponsoring ATO'. 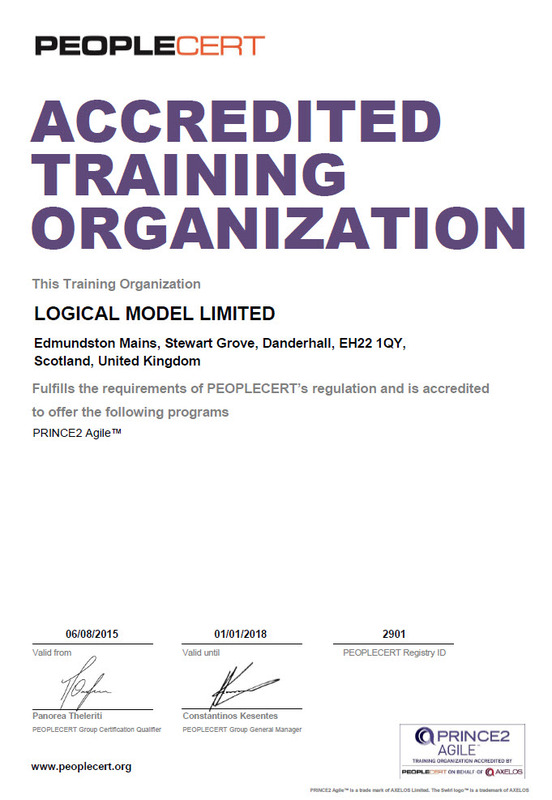 Accredited Training Organisation. ATOs are appointed by Examining Institutes appointed by AXELOS. We are full accredited. Buy the exam from us >>Here<< . Why would I want your course? We provide our narrations as text and audio as well as linked to slide animations. You can read in the bath or listen on a spin-cycle in the gym? Did we mention that we added the structuring to make the core topics into bite-sized chunks? What are your other courses? Good question! :-) We believe that exam courses establish knowledge foundations upon which to grow capability beyond the exam's syllabus. So our courses include exam courses (prince2, p2-agile, pmp) but much more besides. Note this is a recurring plan.